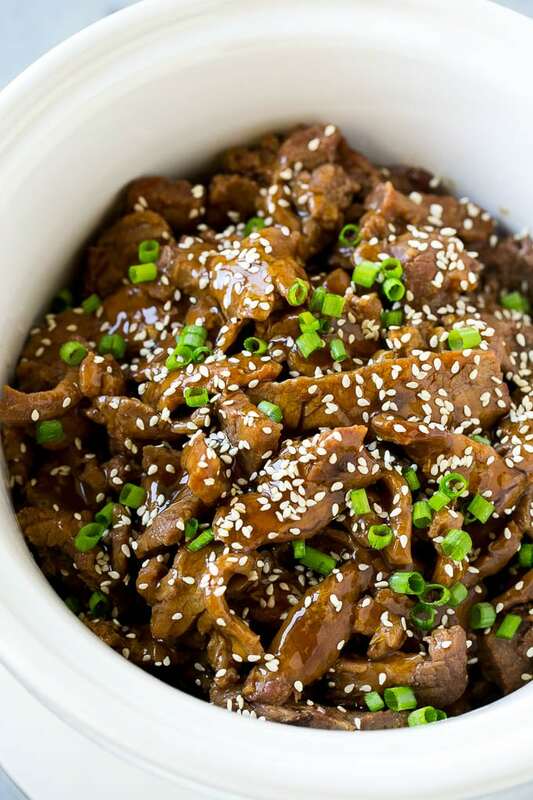 This slow cooker Korean beef is flank steak simmered with soy sauce, sesame oil, brown sugar, garlic and ginger in a crock pot. The meat is fall apart tender and perfect served over steamed rice! 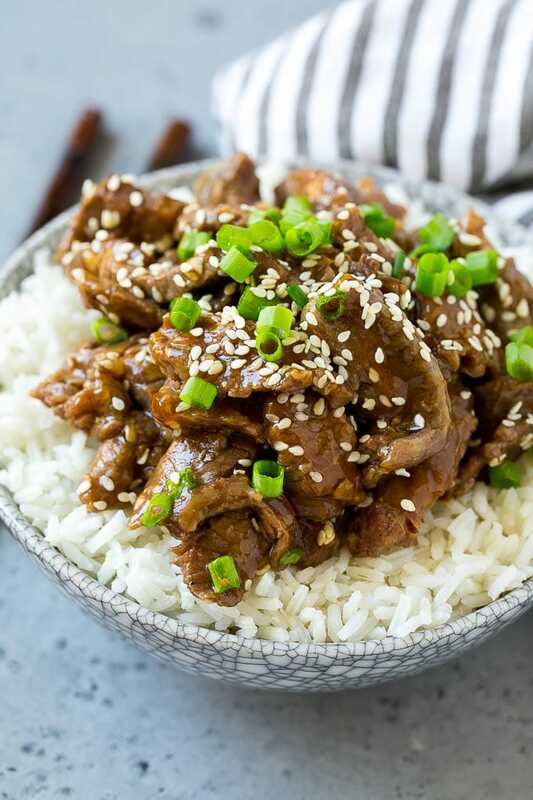 My family loves sweet and savory Korean style beef, and this slow cooker version couldn’t be any easier to make! If you’re looking for Korean beef in a hurry, try my Korean beef bowls or Korean BBQ tacos. Korean beef is popular for good reason – that sweet and savory combo just can’t be beat! This slow cooker Korean beef takes just minutes to prepare. Place it in the slow cooker in the morning and come home later to dinner waiting for you. 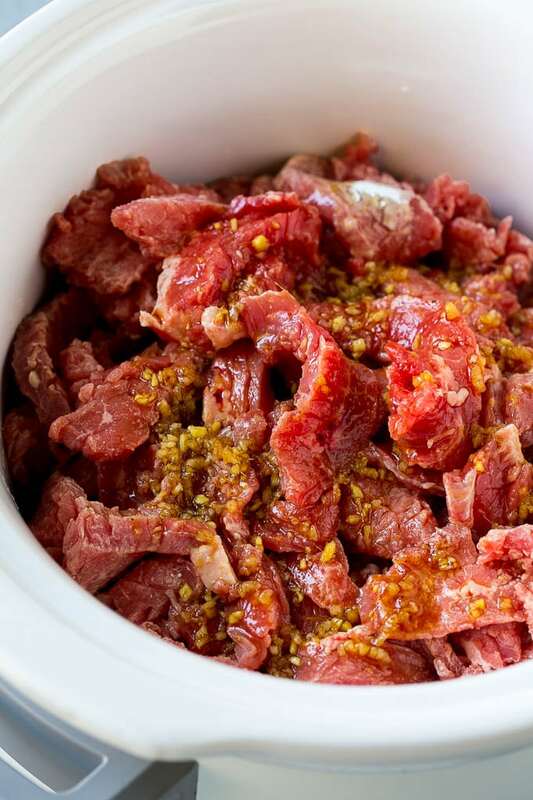 How do you make slow cooker Korean beef? This recipe starts with thinly sliced flank steak. The easiest way to get thin strips of meat is to partially freeze your steak before you slice it. The meat is coated in cornstarch and placed in the crock pot, then a sauce of soy sauce, sesame oil, brown sugar, garlic and ginger goes over the top. I use flank steak for this recipe because it’s relatively inexpensive and always comes out super tender. 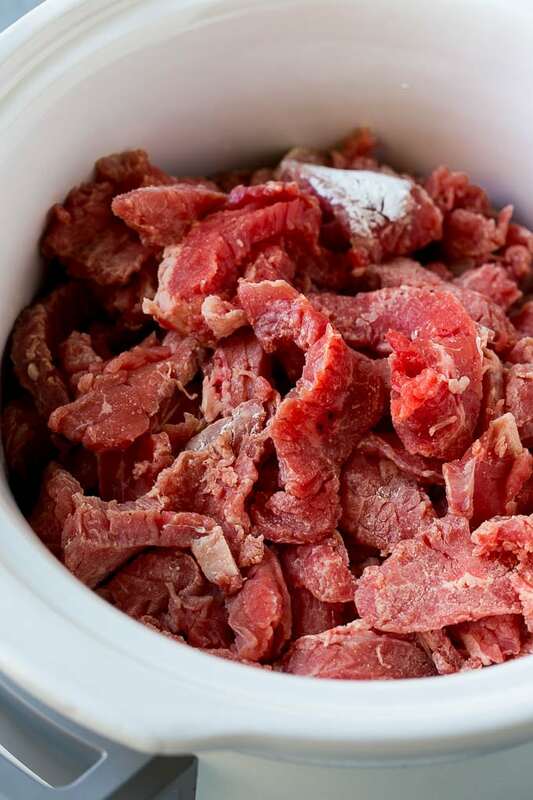 If you don’t want to use flank steak, you could try a tougher cut of meat like beef stew meat cubes, but you’ll have to cook it for a few more hours. I like to save on prep time by slicing my meat and mixing up my sauce the night before. That way in the morning, it takes literally 2 minutes to toss everything together and be out the door. You can also make this recipe with chicken, I like to use cubed chicken thighs for a different flavor. I really think that fresh garlic and ginger give the best flavors in this dish, but if you don’t have them on hand, you can use bottled minced garlic and ginger or even ground garlic and ginger. If you use ground garlic and ginger, try using 1/2 teaspoon of garlic and 1/4 teaspoon of ginger for best results. 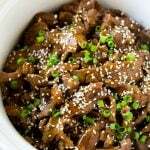 I typically serve my slow cooker Korean beef over rice, but sometimes I mix things up a bit and serve it with quinoa or noodles. If you’re watching your carbs, you can even try using zucchini noodles. This dish is great for meal prep. Simply divide equal amounts of Korean beef and rice into meal prep containers and store in the fridge until you’re ready to eat. If you’re a fan of spicy food, I’d recommend adding some sriracha or crushed red pepper flakes to the sauce when it goes into the slow cooker. You can also stir in some vegetables during the last hour such as carrots, broccoli or green beans. 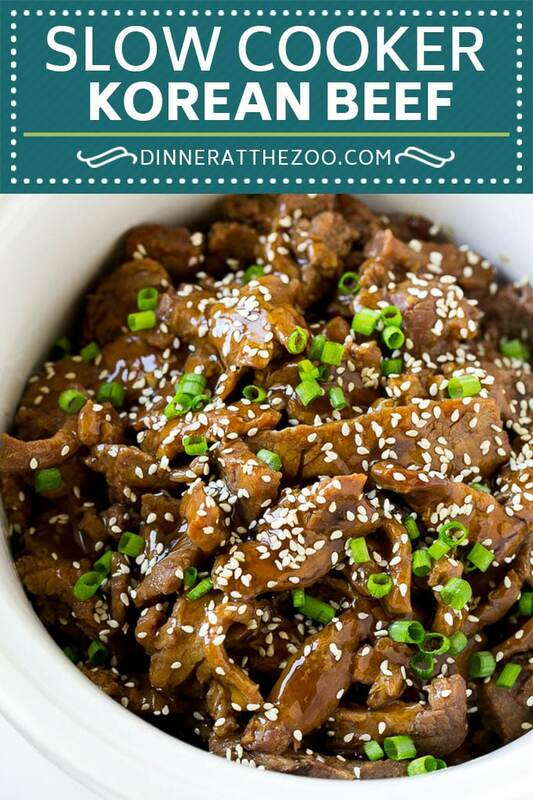 I make this slow cooker Korean beef constantly, it’s so easy and flavorful and tastes just like the restaurant version. You shouldn’t need to add any extra time! This looks amazing. I can’t wait to try it out next week. Thanks for sharing. 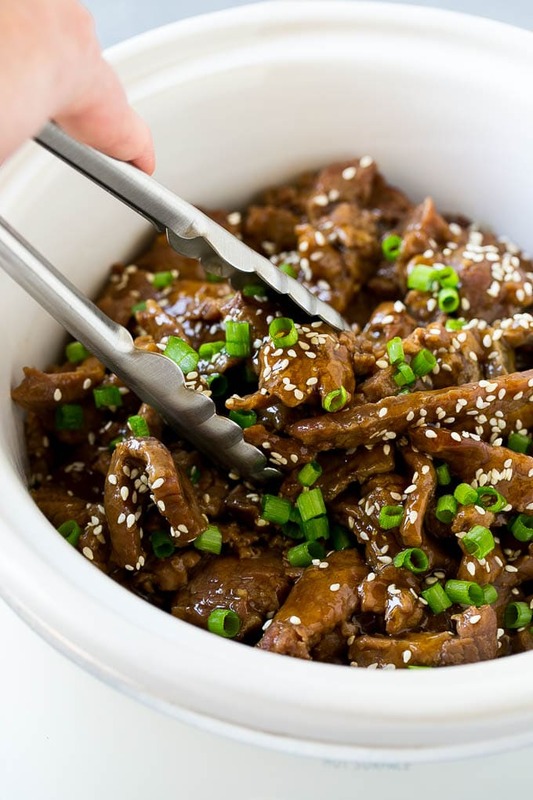 That slow cooker Korean beef sounds really flavorful and delicious! Maybe I’ll try this recipe by next week. I love Korean food so I will def. be trying to make this.Thanks for sharing. This looks a nice and easy recipe to prepare. What an interesting concept to partially freeze the meat before throwing it into the slow cooker. This is one of my favs on the blog. The end product looks great and I’ll love to replicate it. Considering that it is slow cool, the aroma must be filling. My mouth is watering!!! This looks delish!!! I actually have never had Korean food before so I would be very interested to try this recipe. I am always looking for new dishes to make in my slow cooker. When it comes to recipes, this is the best site for me to check. Today, I just learned of a Korean dish, thanks to you post. I love the recipe it’s a dish that I always order at the Chinese restaurant. I no longer eat beef so I am sad I can’t make this. But you’re right add some white rice with and you’re in heaven. Yum this looks so tasty! Now I’m craving it for dinner! Hmmmmm I’m drooling! This Korean beef look soooo delicious. My family would love this. This looks so delicious that even my kids might eat it.